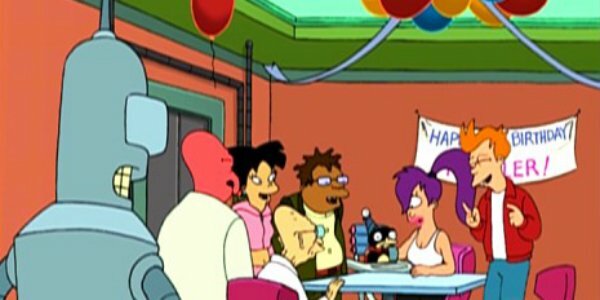 Good News Everybody, Futurama Is 15! Forget fictional anniversaries, Futurama first aired fifteen years ago today (March 28, 1999), so let's all wish Matt Groening's (superior) animated series a happy birthday! Well, as happy as an off-air birthday can be, especially since the comedy was shown the door not that long ago. Of course, that wasn't the first time it had been cancelled (having been dropped by Fox before making four movies and being resurrected by Comedy Central) so perhaps life still exists for Futurama on yet another network? It's possible. Groening and co-creator David X. Cohen have made it clear they have more stories to tell. And good news everybody, whether or not they find another permanent home, the Planet Express crew will definitely be back at least once more thanks to the upcoming cross-over with The Simpsons. Ever since Groening's second animated comedy made its debut, fans have wanted to see the characters from his two different shows share the screen à la The Jetsons Meet the Flintstones and that dream will soon be a reality. The special event was announced at last year's Comic-Con, discussed at both the Futurama panel and The Simpsons', and was originally planned as either the latter's 25th season finale or 26th season premiere. It's now set for sometime this fall and seems to be a play on The Terminator. Wow. 26 years. Even if the sci-fi comedy doesn't come back for good, at least Futurama never overstayed its welcome and we'll always have its two wonderful series' finales ("The Devil's Hands Are Idle Playthings" and "Meanwhile") as consolation. Not to mention the 122 other episodes and four feature-length films. The series' consistent brilliance always amazed me, with the writers churning out plots as silly as they were smart (and they were very smart... like scientifically sound smart). Futurama also became known for it's unique ability to tell really emotional stories despite being 'just' an animated comedy. I once picked "The Problem With Popplers as my favorite episode, arguing largely that since it's the funniest installment, it must be the best, but if I had to choose again, I might choose one of the tear-jerkers like "Jurassic Bark," "The Luck of the Fryrish" or "The Late Phillip J. Fry." To quote Fry from the final-final installment, "what do you say, want to go around again?" All 'ten seasons' of Futurama are on Netflix.